Only licensed in 30 states and D.C.
Better.com, founded in 2014, is a relative newcomer to the online direct mortgage lending scene. 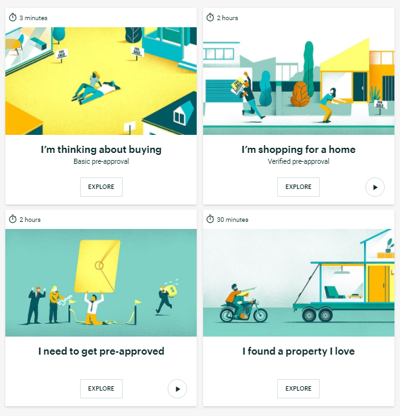 The startup’s mission is to disrupt the mortgage process by “taking apart old mortgage infrastructure and replacing it with thoughtful technology.” This means a better and quicker online loan experience for borrowers. In addition to digital optimization, Better.com promises competitive prices with the $1,000 guarantee. If a customer receives a cheaper loan estimate, Better.com will either pay the customer $1,000 or charge that much less. Better.com doesn’t charge origination fees or commissions, and promises radical transparency to the lender. While the company only originates loans in 30 states, it’s growing fast. In fact, in January 2019, Better expanded into Alaska, Kentucky, Oklahoma and West Virginia. Later that month, the company announced a large round of Series C funding totaling $70 million. Some of the company's investors include American Express Ventures and Goldman Sachs, among others. At the moment, Better.com offers fixed-rate or adjustable-rate conventional and jumbo loans, as well as FHA loans. Customers interested in certain government-backed loans, such as VA or USDA, won’t find these products offered at Better.com. Does Better.com Operate in My Area? Better originates loans in Alaska, Alabama, Arizona, Arkansas, California, Colorado, Connecticut, Delaware, Washington D.C., Florida, Georgia, Illinois, Iowa, Kansas, Kentucky, Louisiana, Maine, Michigan, Mississippi, North Carolina, North Dakota, New Jersey, Oklahoma, Oregon, Pennsylvania, South Dakota, Tennessee, Texas, Washington, West Virginia and Wisconsin. What Kind of Mortgage Can I Get With Better.com? Better.com offers conventional and jumbo fixed-rate loans and adjustable-rate loans. Aside from FHA loans, you won’t find specialty loan types, like VA or USDA, at this online-based company. Fixed-rate mortgage: Better.com offers 15-year, 20-year and 30-year fixed-rate mortgages. With this type of loan, your interest rate stays the same for the life of the loan. That means you can expect the same principal and interest payment each month. This option is usually what homebuyers choose if they plan to live in the home for the long haul. Better.com offers fixed-rate loans for single-family, multi-family, condos, townhomes and planned unit development (PUD). Adjustable-rate mortgage: The interest rate on an adjustable-rate mortgage will change after an initial fixed period. Better.com offers 5/1, 7/1 and 10/1 ARMs. The first number indicates how many years your rate is fixed, and the 1 indicates how often your rate will increase or decrease, in this case once a year. Homebuyers who plan to flip a house or resell after a few years of occupying sometimes opt for an ARM because of the lower initial interest rates. Jumbo loan: Conventional loans generally have a purchase limit that’s determined by the county the home is in. If you’re planning on buying an expensive home above the conforming limits, you’ll apply for what’s called a jumbo loan. 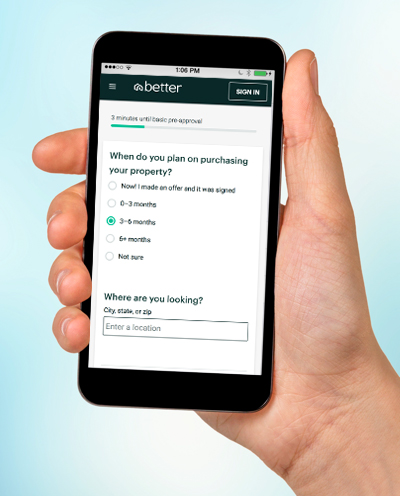 Better.com offers jumbo fixed-rate and ARM loans. FHA loan: Offered in conjunction with the Federal Housing Administration (FHA), FHA loans will allow you to escape the need for a large down payment. Besides its low 3% minimum down payment, even home buyers with a checkered credit past can get approved. You can pick between a 30- or 15-year fixed-rate term for this loan. Refinance: Better.com offers refinances to homeowners looking to secure a new loan. You won’t have to pay origination fees on the loan but you will have to pay closing costs. What Can You Do Online With Better.com? As a startup company, Better.com was built and optimized for online use. All its services are accomplished remotely through its digital platform. While you have the option to call a loan consultant, you won’t need to travel to an actual location to complete your mortgage paperwork. To start, you can self-educate with Better.com's website to learn more about the home buying process. You can learn more about how your credit score affects your mortgage, how to improve your debt-to-income ratio and a number of other mortgage topics. There’s a guide to what a loan estimate contains as well as more information if you’re interested in refinancing. If you want to get started right away, the entire mortgage application process can be completed online. From pre-approval to loan application, your whole mortgage journey can be accomplished from behind your keyboard. You’ll need certain documents on hand, but if you have the required information, you won’t have to speak to a human being unless you want. Once you apply, you’ll have an online account where you can track your application process every step of the way. You can access your account on mobile as well. The site is mobile-friendly and doesn’t require a separate app to access. Would You Qualify for a Better.com Mortgage? The first thing to check is your credit score. Better.com only offers loans to customers with a 620 or above, which is considered fair under FICO credit score ranges. While 620 is the baseline at Better.com, you’ll receive better mortgage rates with a higher score. Most lenders recommend that you improve your credit score as much as possible before applying ffor a mortgage. That way, you can lock in better rates and save money over the life of your loan. After credit score, lenders usually consider your employment history and income. Bonuses, commissions and overtime can complicate what Better.com considers your verified income. Self-employment can complicate things as well. Your financial status will be scrutinized because the lender needs to verify that you can support mortgage payments for the entire length of the loan (which is usually 15 to 30 years). Your savings are another factor lenders take into account. This is mainly for your down payment, which is usually 20% of the home price. Better doesn’t give credit for funds that come from ineligible sources, such as cash deposits or credit card advances. If you plan to use assets from a business account, Better considers it on a case by case basis. Another consideration is your debt-to-income ratio. This is how much monthly debt you pay (from student loans, car payments, credit card debt and more) compared to your monthly income. Most lenders prefer 30% or below. What’s the Process for Getting a Mortgage With Better.com? You start by choosing one of four options: refinance, basic pre-approval, verified pre-approval or mortgage application. The estimated time it takes to complete the application for each option is displayed, which is an element of transparency helpful for borrowers. If you’re pursuing a mortgage pre-approval, you begin the application by answering questions about how far along in the home buying process you are. After that, you create an account, provide your address and Social Security number and continue with a soft credit check. Better.com advertises that it takes three minutes for basic approval. You receive a basic approval letter that helps you get a general sense of what you can afford. This is enough for some realtors who want to see how much home you can afford, but if you’re in a competitive market and need something more concrete, you can apply for a verified pre-approval letter. This takes longer and requires more work on your part. You need to upload financial documents such as tax returns, bank statements, W-2s and paystubs for Better.com to review. It generally takes Better.com 24 hours or less to review and generate a pre-approval letter. These services are free, and you’re not obligated to get a loan from Better after applying. Once you make it through the first steps, you’ll be assigned a loan consultant who you can contact by phone, email or chat weekdays from 9 a.m. to 9 p.m. ET. During the process you’ll select your preferred loan type and rate. If you want to lock your rate, you have to complete the remainder of the application within the time frame assigned to you by Better.com, and then your interest rate is guaranteed. One thing to keep in mind is that Better.com won’t offer you a lower rate in the case that rates drop from when you locked yours in. This is called a float down option. Better.com doesn’t support this option due to the cost to the lender. However, Better.com offers a price guarantee over competitors, but the offer is only valid if you haven’t locked your rate yet. If you can find a lender with better price within three days of your loan estimate, Better.com will beat the competitor’s offer by $1,000 or pay you $1,000. Better.com states that it closes on loans three to six weeks after you lock the rate. When you reaching your closing date, you’ll pay a number of fees and charges dependent on the location of the property as well as sign a variety of documents finalizing the contract. Some states charge mortgage tax or county fees, so it will depend on your situation. You also have to consider title insurance and homeowners insurance as additional costs to factor in. Your loan consultant at Better.com should be able to answer any questions you have about the closing process. It’s the final step before you get the keys to your new home. Better.com is still in its debut years, so it remains to be seen what features the company will add as it grows as a company. As it stands, there are limitations to choosing Better.com as your mortgage lender. The first is the lack of availability: Better originates loans in just 14 locations. This company is optimized for the online experience, not the in-person one. You do have the option to speak to a loan consultant via phone, but that’s not always an equal substitute for those seeking a more human experience. However, that’s part of the reason why Better.com is more affordable: staff members don’t get paid commission. The next limitation is the lack of loan options. If you have a credit score below 620, you won’t qualify for a loan through Better.com. The company also doesn’t offer VA or USDA loans. This means if you’re a veteran or an individual buying rural property, you’re better off seeking a lender elsewhere. If you’re attracted by the online features Better.com offers, but want to apply for specific specialized loans, you’ll have to take your business to a larger lender, such as Quicken. HELOCs are another option you won’t find at Better.com, but can find at traditional lenders such as Wells Fargo or Chase. Lastly, if you enjoy Better.com's service, it won’t last the life of your loan. After about 30 days, Better.com transfers your loan to a permanent servicer. You’ll have to set up automatic payments with whatever company your loan is transferred to. Better.com processes your application, underwrites and funds your loans and then passes you on to a different company. This practice is common among brokers and lenders, but may be a drawback if you chose Better.com because of its online experience. You’ll only work with the company until after closing. Your credit score is a major determining factor in what kind of interest rate and loan offers you'll receive when you're on the search for a mortgage. Therefore it's extremely important that you take a look at your credit report prior to applying so you don't get surprised. When in doubt about anything finance-related, including a mortgage, a financial advisor could become one of your most trusted assets. To find one in your area, take the time to answer a few questions about your personal finance situation within the SmartAsset financial advisor matching tool. From this, you'll be set up with as many as three advisors in your area.